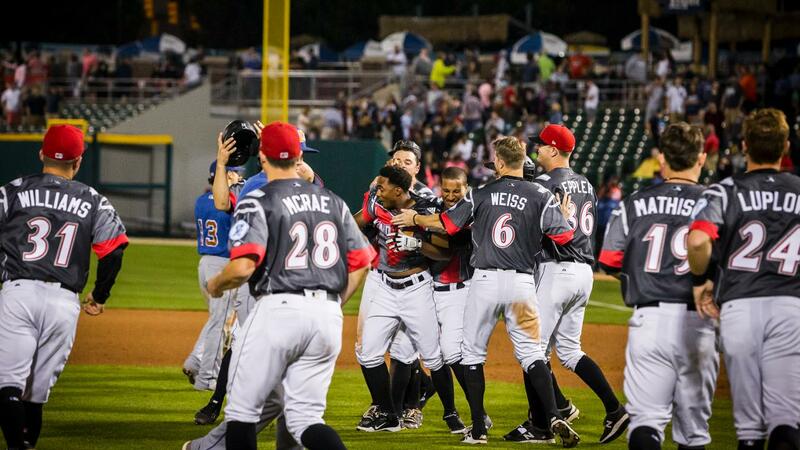 INDIANAPOLIS - Facing the team who eliminated the Indians in the 2017 Governors' Cup Semifinals, the Tribe secured sweet revenge in a back-and-forth Saturday night slugfest with the Durham Bulls on June 23 at Victory Field. The Indians overcame 2-0, 5-3 and 6-5 deficits to eventually win the game in 10 innings, 7-6. Much like the first nine innings of play, the final frame provided plenty of drama. In the top of the 10th, the visitors had runners at the corners with no outs against Josh Smoker. The ensuing play saw the lefty field a comebacker by Adam Moore and start a 1-4-3 double play, all while looking Brandon Lowe back to third base. He then retired Ball State product Jeremy Hazelbaker on a groundout to short to set up Indy's walk-off in the home half. The Indians' rally against Mike Franco in the bottom of the 10th started with a sacrifice bunt by Ryan Lavarnway. The Tribe catcher reached first base safely on the play and eventually moved to second on defensive indifference. Franco then walked Max Moroff and struck out Wyatt Mathisen before walking Pablo Reyes on four pitches to force home Kevin Kramer as the decisive run. Lowe provided two jolts of offense for Durham early on. He belted a two-run homer off J.T. Brubaker in the second and answered a Lavarnway three-run blast in the second with one of his own in the fourth that made it 5-3. The Tribe leveled the score in the fifth against Chih-Wei Hu, using a Kevin Newman double, Jung Ho Kang two-out walk and Jordan Luplow two-run double to make it 5-5. Lowe and Hazelbaker collected doubles in the sixth, however, to push Durham back in front by one. They threatened for more in the seventh and ninth but came up empty both times. Lowe struck out swinging against Bo Schultz to end the seventh and was caught looking at strike three from Smoker to cap the ninth. That momentum carried over to the bottom of the ninth for the Tribe. Erich Weiss worked a leadoff walk and was sacrificed to second by Newman. Reyes then pinch ran for Weiss and scored on a clutch two-out, two-strike single by Kang. The Indians nearly walked it off in that frame, but Kang was cut down at the plate trying to score on a base hit by Kramer.